Al Shanker Each year, the United Federation of Teachers proudly awards nearly $1 million in under­graduate and graduate scholarships to academically excellent and financially eligible students from New York City public schools. Scholarship winners are living proof that excellence can thrive in New York City schools. Their hard work — and the dedication of all the educators who worked with them — enable them to achieve academic distinction. The UFT is the union that represents the city’s public school teachers, paraprofessionals, guidance counselors and other educators. We believe that education is the door to a productive life and that our students have what it takes to overcome personal and financial strains in the pursuit of learning. Our scholarship program, which began in 1969, was renamed in Albert Shanker’s memory in 1997. He was the New York City teacher who became president of both this union and our national affiliate, the American Federation of Teachers. 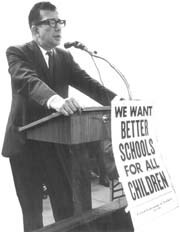 More than anyone else, Albert Shanker put education at the top of America’s political agenda because he cared deeply about students and wanted them to receive top-quality educations. We are proud that these scholarships will continue to help hundreds of our students go to college each year, many to top universities around the country. We invite you to find out how you can apply for these awards. The Fund awards more than 200 college scholarships to outstanding public high school graduates every year. Each award totals $5,000 — that is, $1,250 a year for four years of college. Albert Shanker College Scholarships are given to students who will be attending an accredited public or private college or university. The UFT also offers nine scholarships to undergraduate winners who go on to pursue full-time graduate studies immediately after college. There are six scholarships of $2,000 over two semesters for those pursuing master’s degrees; one medical school scholarship of $8,000 over four years; one law school scholarship of $6,000 over three years, and one Education Scholarship of $6,000 over three years.